Meatloaf is a seriously filling dish, packed with proteins, and very easy to vary with whatever you may have in your refrigerator. As I visited my friends at Løten last weekend I made an Italian style meatloaf filled with tasty Mediterranean ingredients. 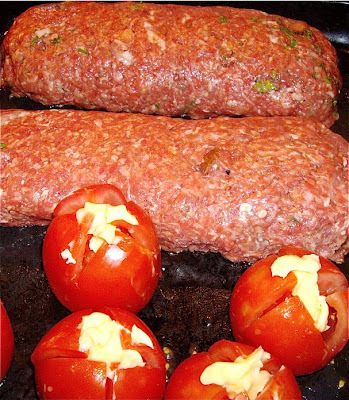 For this recipe, I used best quality, low fat ground beef (Karbonadedeig), and did not add more fat. To hold the mix together, I used only eggs and one diced bread roll. If you would like a richer meat loaf, substitute some of the ground beef with diced pancetta or streaky bacon, but remember to reduce the amount of salt accordingly. I used Pomamore, a new product from Riddarheim in my filling. 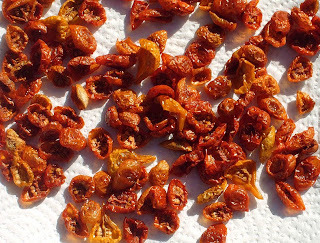 It is made up by sun dried tomatoes, fresh basil and Parmesan cheese in olive oil. As this product most probably will not be available outside Scandinavia, use your favourite pesto (mine is Barilla) instead and dried tomatoes in olive oil. The filling may be varied with other ingredients, but do remember to avoid ingredients with much liquid. It will hardly work well with fresh tomatoes. Mix ground beef with garlic and chopped onions. Soak diced bread in milk. Add to ground beef mixture with beaten eggs. Use hands to mix well. Season with salt, pepper and herbs. Allow mixture to rest. Cut the mixture into two batches. In order to make a loaf, roll out a sheet of cling film and add olive oil. Put on batch of meat loaf mix on the sheet and press it into a flat square. Place the Pomamore or spread the pesto in the middle of the sheet . Do not add mix out to the edges in order to seal all inside the meatloaf. Then add tomatoes, sliced mozzarella and Parmesan cheese. 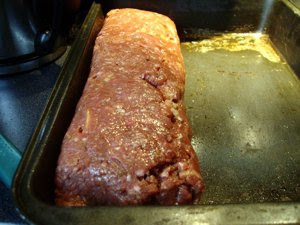 Then fold the meatloaf mix over the filling and make the meat loaf. Seal the ends properly to keep it all inside and place the loaf in a baking tray. I used a large baking tray, and to make it all easier I added diced vegetables on the other half of the tray and seasoned well and poured a little olive olive oil. In this way you make dinner in one operation. Place in a medium hot oven (200C / 400F) for one hour. Serve with oven roasted potatoes, vegetables and you favourite gravy.